A couple of months back Disney started the demolition of the old Planet Hollywood restaurant at Disney Springs, all in preparation for it to become the new Planet Hollywood Observatory. Both the outside and inside of the restaurant will change to look more like a 20th century observatory. In some new concept art that was recently released, we get a closer look at the interior of the restaurant as well as the Stargazers bar and patio. The Stargazers bar and patio area will be located at the rear of the building and have an amazing view of Disney Springs. This will surely be a popular space for people waiting for their dining reservations. The inside does feel a bit similar to the previous interior with video walls and celebrity memorabilia. But the celebrities will not be the only stars inside the restaurant as the ceiling will be transformed into a star-studded sky. And for some reason Bella and Edward from Twilight make an appearance on one of the screens. Interesting choice Planet Hollywood! 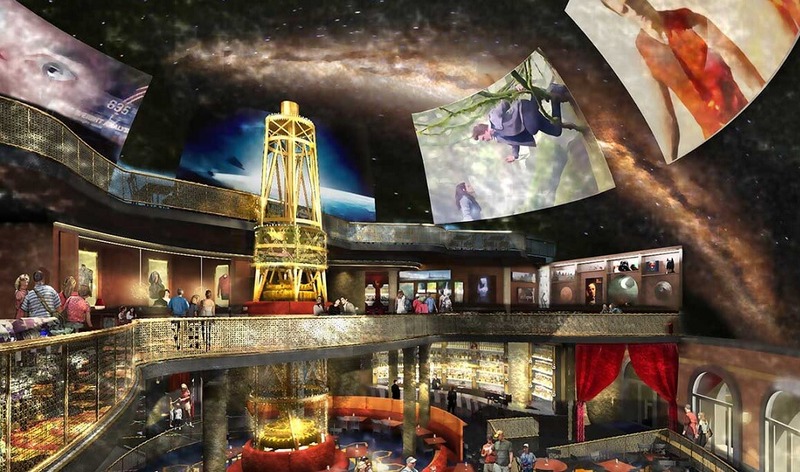 Planet Hollywood Observatory will open Summer 2016.